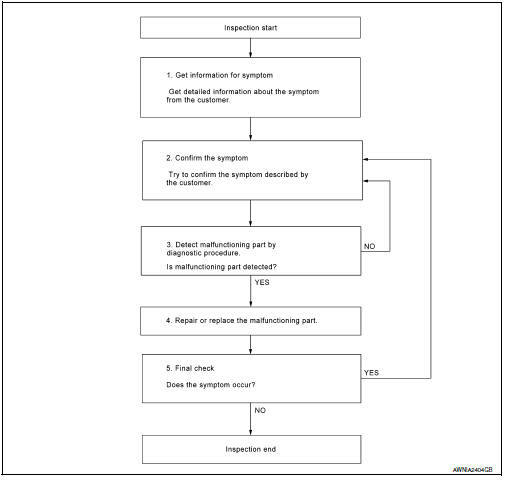 Try to confirm the symptom described by the customer. Verify relation between the symptom and the condition when the symptom is detected. Refer to AV-393, "Symptom Table". Replace AV control unit. Refer to AV-406, "Removal and Installation". If вЂњBefore Replace ECUвЂќ operation was performed, automatically an "Operation Log Selection" screen will be displayed. Select the applicable file from the "Saved Data List" and press вЂњConfirmвЂќ to write vehicle specification. Refer to AV-350, "CONFIGURATION (AV CONTROL UNIT) : Work Procedure". If вЂњBefore Replace ECUвЂќ operation was not performed, select "After Replace ECU" or "Manual Configuration" to write vehicle specification. Refer to AV-350, "CONFIGURATION (AV CONTROL UNIT) : Work Procedure". Reads the vehicle configuration of current av control unit. Saves the read vehicle configuration. "After replace ecu" Writes the vehicle configuration with manual selection. "Select saved data list" Writes the vehicle configuration with saved data. Identify the correct model and configuration list. Refer to AV-351, "CONFIGURATION (AV CONTROL UNIT) : Configuration List".